A merit- making ceremony was held at the Rati Lanna Riverside Spa Resort Hotel recently with the executive officers and staff led by Paichayon Vunnasiri, Resident Manager. 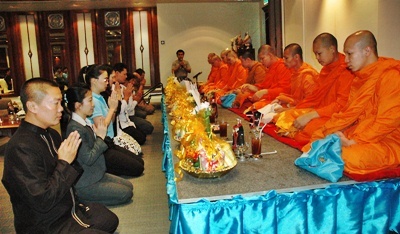 The hotel’s grand merit making ceremony is an annual event with offerings of food and also lunch for nine Buddhist monks at its Wiang Fah meeting room. 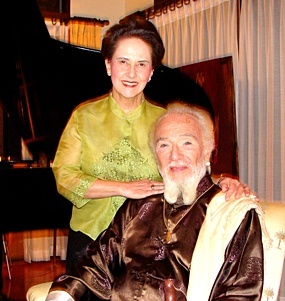 Dr. Howard Graves, icon of Chiang Mai musical life, and Anne E. Murase, Co-founder of the Chiang Mai Music Festival await with anticipation the formal recital by Santi School of Music students at the Murase home where almost forty enthusiastic guests gathered in support and celebration of youth and classical music. Shannon Morrow, 3rd left, the wife of U.S. Consul General Michael K.Morrow, presided over the opening ceremony of an exhibition titled ‘10 years Stepping Forward, Elephant and I’. The exhibition, featuring art about elephants, will run to March 31at the second floor of the Central Airport Plaza. 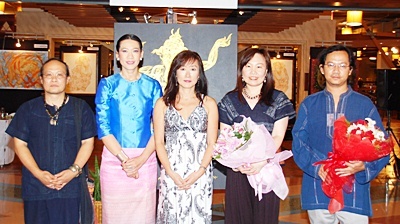 Attending the event, here from left,　Ajaan Boonrat na Vichai, of the Sala Lanna Club, Anchalee Kalmapijit, of Hug Chang Club, Shannon Morrow, Orachorn Chantarawiwatana, of Central Airport Plaza, and the featured artist, Chakraphan Chaijit.